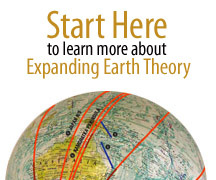 This site promotes information about the Earth, and explains the Expanding Earth Theory. We introduce hard to ignore new visual evidence with information, history, charts, and links to resources. 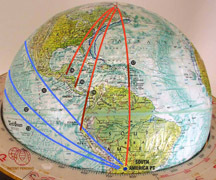 A unique 12″ Globe stand was developed to easily understand, measure and plot earth features. WHY SHOULD You READ THIS? Because the most vital science foundations you have been taught are not as accurate as you believe, and the alternative will eventually shake your world. Standard Science Dogma, from the Big Bang to Plate Tectonics to Evolution of Species, Atmosphere, Oceans, land masses etc, accepted the theory of a constant size earth. Not because it has been proven, but because it was the most obvious assumption that seemed to synchronize best, with all of the other theories. (And scientists likely assumed it had been proven). There are strong alternatives to each theory above, however. These Alternatives also synchronize to form a totally different science view. 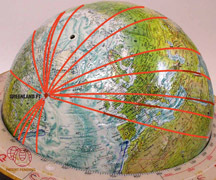 The Earth is Expanding. Mass is increasing. Gravity is increasing. The climate for millions of years has been cooling. 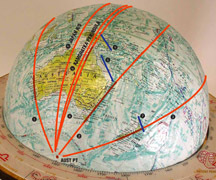 which continue to reorient the Earth’s Crust.